Red Yeast Rice, has been cooked and also utilized for its medicial properties for a long time. It is made by fermenting the yeast, Monascus purpureu, over red rice. Red Yeast Rice has compounds such as Monacolin K, which is the same as Lovastatin (Sloan-Kettering). Statins, like Lovastatin, are very effective in decreasing LDL Cholesterol. However, due to regulations by the FDA, many Red Yeast Rice products on the market do not contain Monacolin anymore (UMMC). Red Yeast Rice lowers Cholesterol and Triglyceride Levels in the blood. In a study conducted at UCLA, 83 Individuals with High Cholesterol were given Red Yeast Rice. 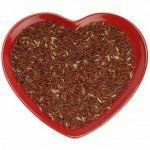 The Individuals given Red Yeast Rice experienced Lower Total Cholesterol, LDL “Bad” Cholesterol, and Triglycerides compared to a group which received a placebo. However, HDL “Good” Cholesterol did not increase, it remained constant (Heber, Yip, Ashley, and et al 231-236). In other studies, Red Yeast Rice produced an increase in HDL Cholesterol. For example, University of Maryland Medical Center cites a study in Red Yeast Rice caused a 16% Decrease in Total Cholesterol, 21% Decrease in LDL Cholesterol, a 24% Decrease in Triglycerides, and a 14% Increase in HDL Cholesterol (UMMC). Red Yeast Rice side effects, although rare, include headache, stomach ache, gas, dizziness, heartburn, muscle aches, and weakness (UMMC). Red Yeast Rice is contraindicated in women who are pregnant or nursing, and in individuals with liver disease (Sloan-Kettering). Red Yeast Rice should not be taken by people on cholesterol-lowering medications, and anticoagulants since it can increase a patient’s risk of bleeding. Also, individuals taking Red Yeast Rice should not drink Grapefruit Juice, as it can result in liver damage (UMMC). Ehrlich, Steve, NMD. “Red Yeast Rice.” University of Maryland Medical Center. N.p., 11 Dec 2012. Web. 2 Jul 2012. Heber, David, Ian Yip , Judith Ashley, et al. “Cholesterol-lowering effects of a proprietary Chinese red-yeast-rice dietary supplment1’2’3’4.” American Journal of Clinical Nutrition. 69.2 (1999): 231-236. Web. 2 Jul. 2012. “Red Yeast.” WebMD. N.p., n.d. Web. 2 Jul 2012. “Red Yeast Rice.” Memorial Sloan-Kettering Cancer Center. N.p., 16 Aug 2011. Web. 2 Jul 2012.